Greyhounds are affectionate, charming, and friendly by nature ... they thrive on attention and love their humans and make great pets. Not all Greyhounds are alike. They share many traits, but like you and me, they are individuals and each one has their own personality. Sometimes when you first adopt your Greyhound, he may be shy and quiet, but his personality will come out as he gets comfortable and gets to know you. They can be aloof, like a cat, sleep like a cat, and the next moment they get this burst of energy and begin running from room to room like they are on a race track for 5 minutes ... then they stop, and go lay down! (A tip for you – if your home is all tile or laminate, you may want to invest in runners and secure them to the tile or laminate so your Grey doesn't slip on the surface and injure himself). Greyhounds or Greyhound like dogs can be found as far back in history as 500 B.C. Greyhounds evolved to hunt in the Middle East and were revered by ancient Egyptians and highly regarded by other cultures in the Middle East. They became established in the United States when the early settlers in the Midwest discovered that Greyhounds were fast enough to take care of jackrabbits that were eating their crops. 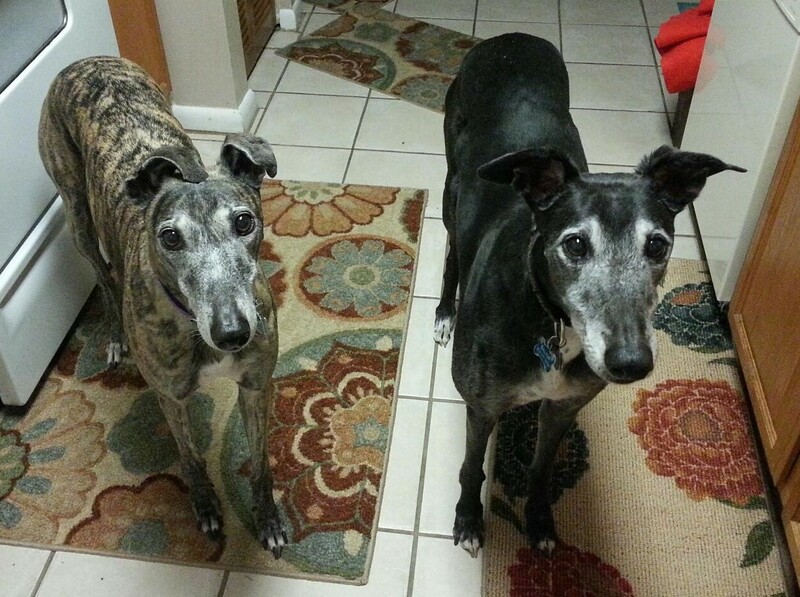 Greyhounds, with proper care, can live from 12-14 years. Boys average weight can be between 65 and 80 pounds, girls are slightly smaller, they can be between 55 pounds to 67 pounds. Greyhounds recognize other Greyhounds – it is amazing, you can be walking your Greyhound and they will be aloof when they see other dogs, but the moment they see another Greyhound, it is like they are long lost buddies and will drag you to meet the other Greyhound! Greyhounds have been kennel broken, not housebroken, but they learn quickly to go outside and relieve themselves. You need to walk them frequently at first and develop a routine ... they will get it. Patience is very important – think about it, they have gone from living in a kennel their entire lives with other Greyhounds and now, they find themselves alone in a strange place with humans hovering over them and expecting them to be like a regular grown dog. They have not been touched while asleep, fed on a strict schedule, no one touches your bowl while you are eating, you are not asked if you have to go out. 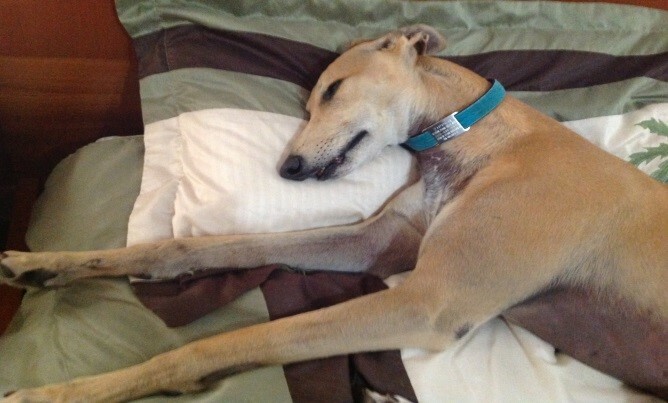 Let your new Greyhound learn about you, being in your home and give him some space and a break. Greyhounds are sensitive ... yelling at them will not achieve anything but having them fear you. Greyhounds are sight hounds, they detect movement immediately with instant reaction times, they have incredible speed and agility to close in on something. This ability allows them to go from a dead stop to 40 miles per hour in three strides. They, unlike other dogs, are bred to chase down prey with little or no guidance from a human. When they are fixed on going after a squirrel or rabbit, they will not pay attention to your calls to have them return to you ... add in the speed, and it could turn ugly very quickly. You need to keep your wits about you when you are walking your Greyhound and keep a good hold on their leash. To keep your Greyhound safe, you MUST make a commitment to NEVER let him off leash, except in an enclosed fenced yard ... electric fences do not qualify. Greyhounds will blast through the electronic fence and never feel anything. With that said, many people like to bring their dogs to dog parks (I personally do not feel a dog park is a safe place for a Greyhound). Greyhounds have very thin skin. What would be a simple scratch to a Labrador Retriever may be a nasty tear, requiring several stitches, for your Greyhound. If another dog at the dog park begins rough play you can be in for a very expensive vet bill or, depending on where they have been bitten, it can be something much worse. If you are with a group of Greyhounds for a play date, the “turnout” muzzle you received when you adopted your dog should be used so when they play hard they don't injure each other by nipping. Like all dogs, some regular exercise is required. Walking your Greyhound a few times a day should be sufficient. First thing in the morning, lunchtime and after dinner and maybe one more quick trip before bed should be good. Please see the information on Heat Exhaustion for walking your Grey here in Florida. Greyhounds have little body fat, this makes them sensitive to heat, cold, and rain. If it is cold outside and you and your Greyhound are outside for more than a short time, they should wear a coat. If you are cold, your Greyhound is cold. We have links for some great Greyhound sweaters, coats and more on our website. If it is raining hard, a raincoat is also good to keep your Greyhound dry. Life here in the Villages is very different for your Greyhound, it is different from anywhere else! Your Greyhound, prior to you adopting him, was in a kennel with many other Greyhounds. He went from the kennel crate to the race track, fed and watered, let out to relieve himself, then returned to his kennel crate. He has never seen traffic, lots of people, music in a town square, and NEVER has encountered golf carts whizzing by as you are walking him. You need to take things slow and introduce him to the Villages world little by little. I wouldn’t recommend taking your Greyhound to the square until you know your dog’s fears and he is comfortable with you and walking. You need to know how your dog is going to react to little dogs who may get in his face (there are more little dogs here in the Villages than big dogs), how he will react to little children running up to him, etc. We try to take our Greyhounds to the town squares during the fall, winter and spring at least once a month ... plan on joining us. If your dog is shy or nervous for the first trip, he will be very comfortable with other Greyhounds and we can always surround him with other Greyhounds to ease his fears. If you want to learn more about Greyhounds, I recommend you read "Retired Racing Greyhounds For Dummies", by Lee Livingood.